"I need some more synonyms for tiny or minimal, but the changes are really small." 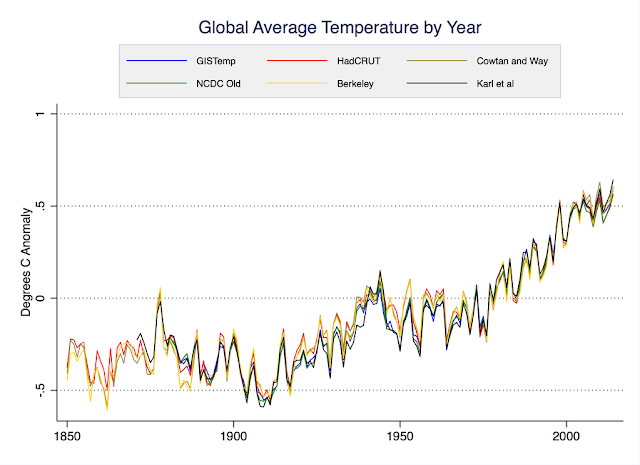 The graph label "Global Average Temperature by Year" ? ? 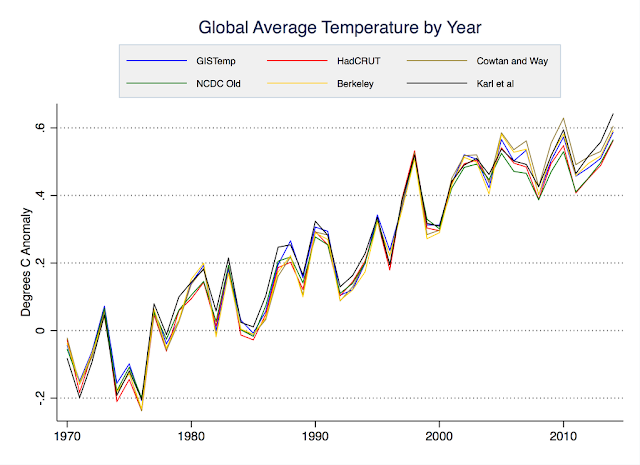 Aren't we talking about "Global Average Surface Temperature"? Considering that the global surface temperature contains roughly 10% of the heat within our global heat distribution engine isn't that grossly misleading? Yes, the default temperature is the surface temperature. No, that is not misleading. The graph shows temperature. Looking at the heat content is convenient for people focussed on short-term changes because it is less noisy. It is useful to assess the radiative imbalance and if you want to debunk a political activist that stupidly claims that global warming has stopped. But temperature is important for humans and it change thus also important. In addition temperature is something people know, heat content is very abstract. Then we still have the changes in precipitation, in the acidity of the ocean, in the variability of the weather, in severe weather, in specific weather phenomena, in the timing of biological processes, in the land temperature and in the ocean temperature, in the Southern and in the Northern hemisphere. There are many ways to look at climate change, they all have their strengths and weaknesses, different datasets have different lengths, resolution and quality; a good scientist looks at all of them. The new adjustments by NOAA seem fair and justified, and it is quite natural that climate sceptics don't like them for ideological reasons. 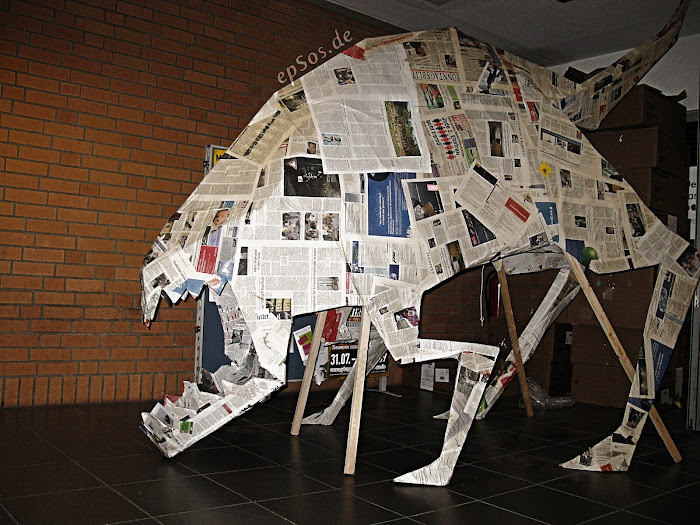 However, the hiatus can be erased by the opposite approach as well, i.e. using no adjustments at all. Actually, the highest trend of all global temperature indices in the 21st century is shown by Nick Stokes TempLSmesh (1.358 C/century) that uses unadjusted GHCNv3 +ERSSTv3. Running the TempLSmesh with adjusted data reduce the trend by about 0.3 C. The reason for this effect is mainly the seemingly unfair down-adjustment of the few high Arctic temperature stations (with big area importance), which have been warming so fast that the homogenisation algorithms find them "suspicious". Cowtan and Way have adressed this issue as well. (Other important areas of the world that are cooled by GHCN are Sudan and the Amundsen-Scott base). I wonder what will happen if Nick Stokes converts to ERSSTv4 and GHCNv4 (unadjusted)? Will the trend become 1.7 C/century? Olof R, that is interesting. Do you have the link to that post of Nick Stokes? 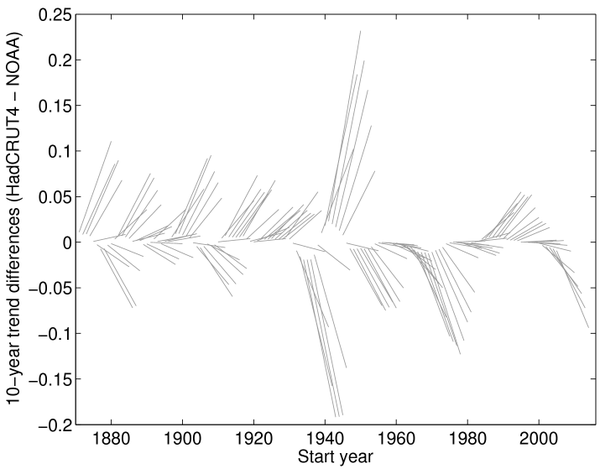 The homogenization algorithm of GHVNv3 suppressed the strong warming in the Arctic because of a combination of a large spatial gradient in the trend and having only a few stations in the Arctic. Relative homogenization algorithms assume that the neighbouring stations have the same climate signal and that is no longer true under such circumstances. The number of stations is now much larger, thus this problem should indeed be much reduced now. It would be interesting to investigate how much this contributes. There would be compensating effect for the global mean in that the larger dataset probably also allowed for a better correcting of cooling biases in the raw data. There is work coming up on GHCNv4. That will also use the ISTI dataset as its basis. Thus we may soon learn more about the reasons. I suspect the new ISTI-based land record from Karl et al will not have as large an arctic issue for the same reason that Berkeley seems not to: significantly more station coverage. Will be interesting to look at Iceland as well, since GHCNv3 likely has an issue with removing localized climate change there too. with a tool that enables trend comparison of adjusted and unadjusted TempLS versions and other global indices. It is only the TempLSmesh, which uses full global kriging-like infill, that gets +0.3 trend with unadjusted GHCN data. I guess that the reason for this is that down-adjustments by GHCN happens to be more common in the vicinity of "empty areas" (the Arctic, eastern Sahara, the South pole), hence the infill procedure give those stations a relatively larger weight by area. Olof R, sorry for the question, I should have thought first and simply look at a previous post on the differences due to homogenization. There is an effect for GHCNv3, but it is really small. The raw data has a somewhat stronger recent trend than the homogenized GHCNv3 data. 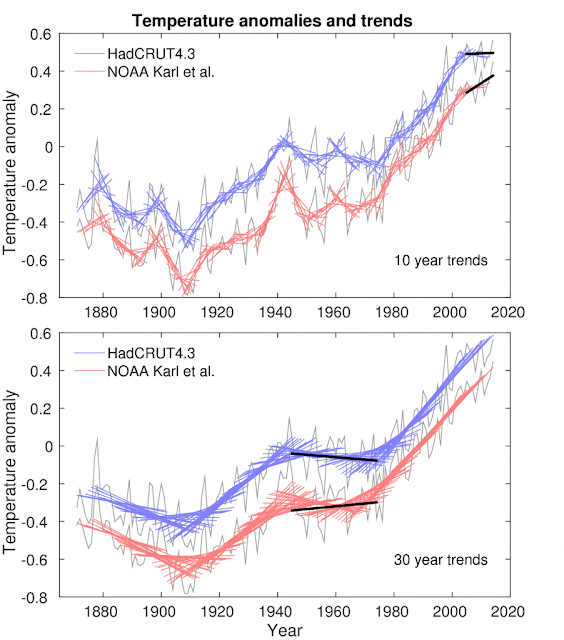 Interestingly, the HadSST3 dataset, which already includes the SST adjustments NOAA now made, like NOAA also shows a somewhat stronger warming in the recent trend due to homogenization. 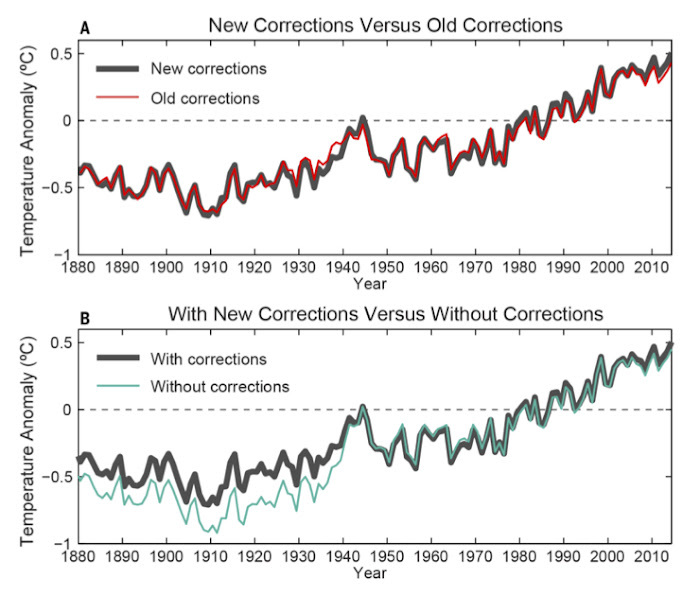 The net effect for the global temperature is a small recent trend increase due to homogenization.